Stage 4-11 is the eleventh stage in the Jungle in the Game Boy version of Donkey Kong. 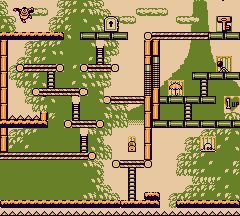 The level has Donkey Kong Jr. throwing Poison Mushrooms and many conveyor belts. Mario starts off on a platform near a friendly Jumper. Mario must go over to a gap with Spikes below and jump over it to get across, then he must climb up the first Ladder to a conveyor belt moving left. Mario must make the jump over to the next conveyor belt while avoiding the Poison Mushrooms Donkey Kong Jr. throws at him then he must then run to the left against the conveyor belt going right then climb up a ladder while still watching out for Poison Mushrooms then once he's up the ladder he must avoid being pushed off by a Dotty going around the conveyor belt and the Poison Mushrooms still being thrown by Donkey Kong Jr.. Then Mario must climb up another ladder then watch out for another Dotty and the conveyor belt moving left which will move him left into the spikes, then he must climb another ladder up to a conveyor belt moving right which makes it easier to make a jump to the final conveyor belt moving left. Mario must get over to and climb the ladder to get up to the next platform. Now if Mario decided to use the Jumper to get up to an area unreachable without it he would be able to get a 1 UP Heart and would skip most of the conveyor belts and obstacles though the Poison Mushrooms can still get him. He would have to use a switch to free himself and would land on a conveyor belt going left as soon as he exits and would have to get pass the three conveyor belts and the last Dotty. Once at the top Mario must go right which leads to a conveyor belt going right to get to the key, then Mario has to head left again then make it to the door to end the level. Hat: Above Mario and the Jumper. The Jumper can help him reach it. Parasol: In the in closed area right in front of the door. Bag: On the first conveyor belt. Donkey Kong Jr. can be defeated by throwing the key at him. This page was last edited on September 7, 2018, at 03:15.